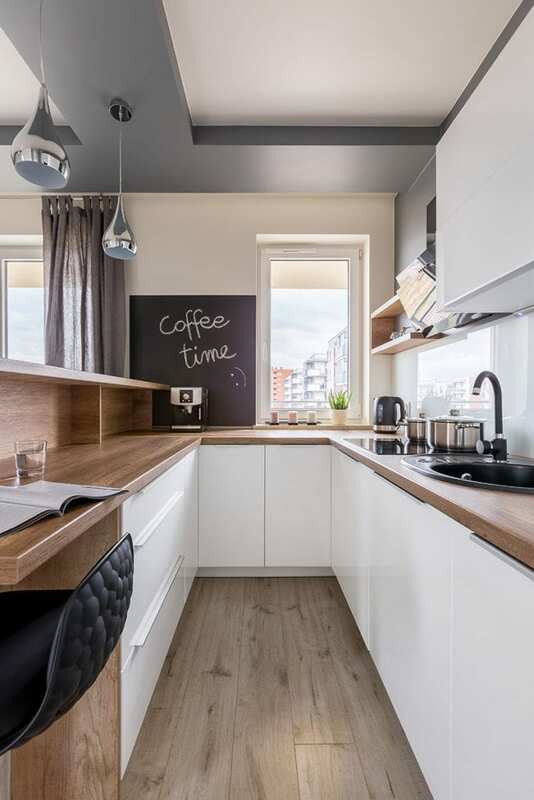 Whether you are considering a kitchen remodeling project in the near future or simply want to spruce up your kitchen space, here are 14 ideas to turn your boring kitchen into a room that makes you smile. One of the best ways to add a bit of personality to your kitchen is to add decorative accents you love. Don’t be afraid to show off your obsession with colorful bowls or your antique teapot collection. You might also try adding accessories of a single color to bring out a favorite color in the wallpaper or backsplash. Pops of color also work great in kitchens that are done in a single color such as white, taupe, grey or black. Free up space in your cabinets and add decorative flair at the same time by displaying your favorite pots and pans, utensils or spices. There are a variety of ways to do this from store-bought spice racks or pot hangers to DIY options, such as a painted pegboard or decorative hooks. Do you have trouble finding a good knife when it’s time to chop vegetables? Have a cutting board, serving spoons or spatula that has seen better days? Are you still using the same cookware set you had when you got married? It might be time for some well-deserved upgrades! Make a list of your least favorite kitchen gear and plan a visit to a local kitchen store for some shiny new utensils, plates, drink ware, or pots and pans. Be sure to choose a few treasured items that you’ll enjoy using every day, as well as a few decorative items to further spruce up your dull kitchen space. Outdated drawer pulls and cabinet handles can make your cabinetry look older than it is. If your cabinetry is still in decent shape, updating the hardware can provide a new, modern look without breaking the bank. Plus, this is a great DIY project you can finish in a typical weekend. Want a bit more design flair? Be sure to look for decorative glass knobs that come in a variety of shapes and colors. Add style, practicality, and a bit of whimsy to your kitchen with your very own chalkboard wall. With the help of chalkboard paint, just about any wall, large or small, can become a decorative space for your grocery list, this week’s menu or messages to family members. Plus, it’s a conversation piece that guests will be sure to notice. Don’t like the mess of chalk in the kitchen? You can create a similar message station or menu board using whiteboard paint. You can find both chalkboard and whiteboard paint at your local big box store. 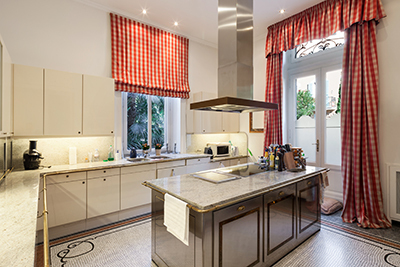 Old, outdated curtains or shades can make your kitchen feel dingy. But it’s easy to brighten things up with new window treatments that add color or a bit of texture. For shorter windows, try a pair of sheer cafe curtains or a brightly-colored shade. For longer windows, color-coordinated drapes or long, flowing curtains work well. You can even personalize inexpensive shades with your own decorative pattern, as shown in this Better Homes and Gardens post. Dated light fixtures can make your kitchen feel old. But, it’s pretty easy to swap out older lighting designs with something fresh and modern. You may also want to consider adding additional lighting to brighten your space and make kitchen chores easier. For example, LED track lighting under the cabinetry is a great option to add extra light for food preparation. You might also consider adding halogen spotlights, placed strategically throughout the kitchen to further brighten your space. Give your kitchen a bit of sparkle by adding a new sink and faucet. Depending on your needs and budget, you might consider installing an under mount sink for added style and versatility. This is especially handy if you’re considering replacing your countertops with solid surface designs in the near future. A new faucet can add functionality, as well as beauty. Consider replacing standalone kitchen sprayers with an all-in-one faucet that features a pull-out spray feature. This saves space and provides a sleek, modern look too. 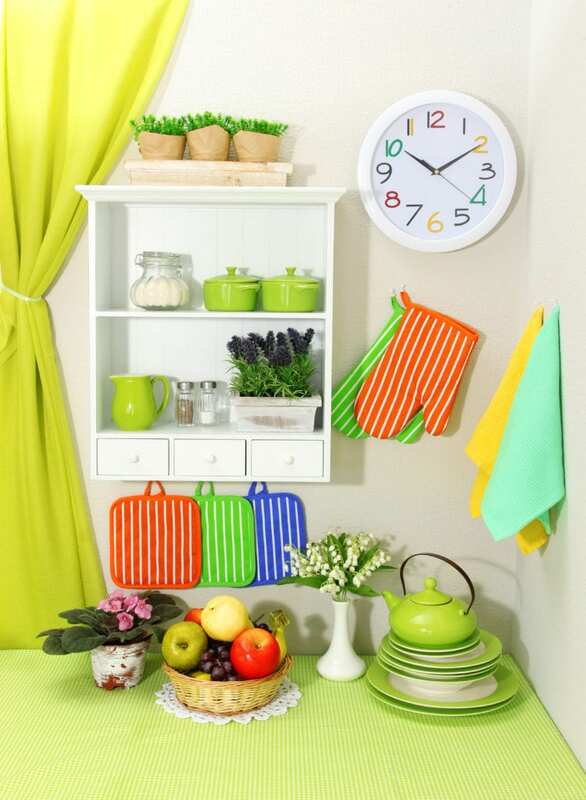 Looking for an easy way to add a bit of color to a dull kitchen? 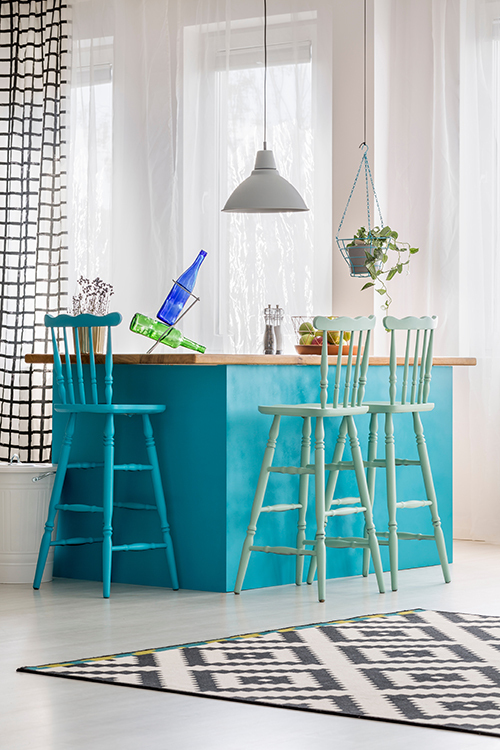 Turn boring dining chairs or stools into works of art with a little paint. This works especially well in kitchens done in neutral tones, adding a pleasing pop of color. However, you can also choose to highlight a color from your favorite tile or a picture from the wall. If painting isn’t your thing, adding decorative cushions can also provide interesting patterns and textures that liven up your space. 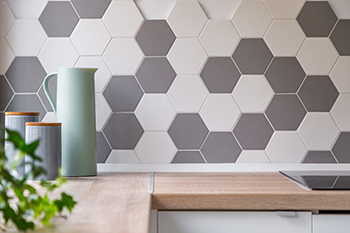 The backsplash is the perfect place to show off your own unique style and it doesn’t necessarily need to cost a lot. There are plenty of budget-friendly tile options at your local home improvement store that are easy to install, even for beginners. But tile isn’t the only option. Painted bead board, vinyl tiles, or even wallpaper are great options to upgrade your backsplash with a little style. Need more space for bake ware, cooking utensils or food preparation? Adding a kitchen island or utility cart could be the perfect solution, providing additional work space and storage options. Stock kitchen islands are available at many home improvement stores and other retailers or you can opt to have one custom made. Custom kitchen islands offer the most versatility since they can be made to fit the dimensions of your kitchen and provide storage options unique to your needs. You can breathe new life into just about any room in your home with a fresh coat of paint. The kitchen is no different. In fact, you can change the whole vibe of the room by simply choosing a fresh color scheme. If your cabinets are light, choosing a darker wall color can add interest and contrast. 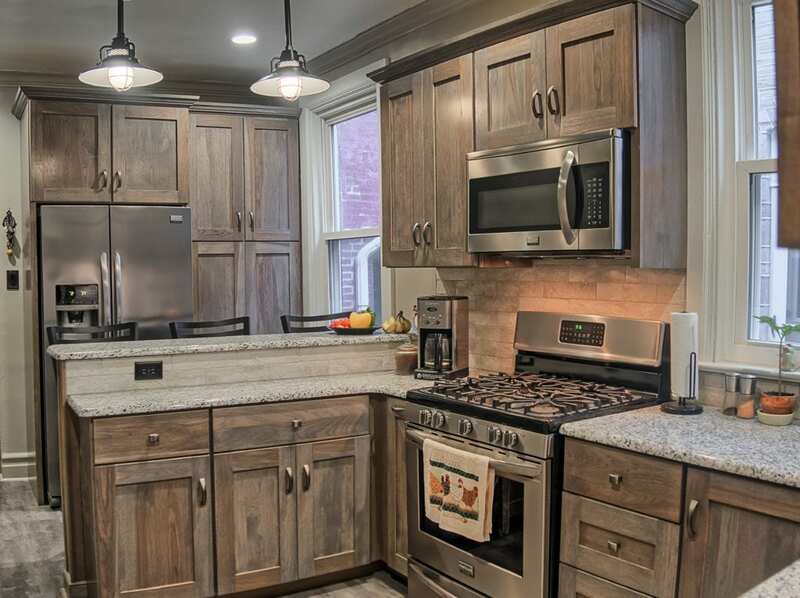 Balance dark cabinetry with a light wall color to create an open, airy feel. Use bold colors to show off your personality or give your kitchen a sense of movement and energy. The possibilities really are endless. Don’t have the time or energy to paint all of your walls? Choose one wall as a focal point and paint it a bright color. You might also choose to use wallpaper or decorative tile to create unique patterns or textures. Of course, one of the best ways to transform your boring kitchen from drab to fab is investing in new cabinetry and countertops. While this is the most expensive of the upgrades on this list, it’s one that will provide lasting value, both in your everyday life and when it’s time to sell your home. At Red Rose Cabinetry we manufacture our own line of handcrafted custom cabinetry, and also offer semi-custom designs. We also carry a great selection of granite and laminate countertops. Be sure to visit our showroom, located in Lititz, PA to see our selection and talk with our design staff. As you can see a little creativity can go a long way when it comes to upgrading your kitchen space. 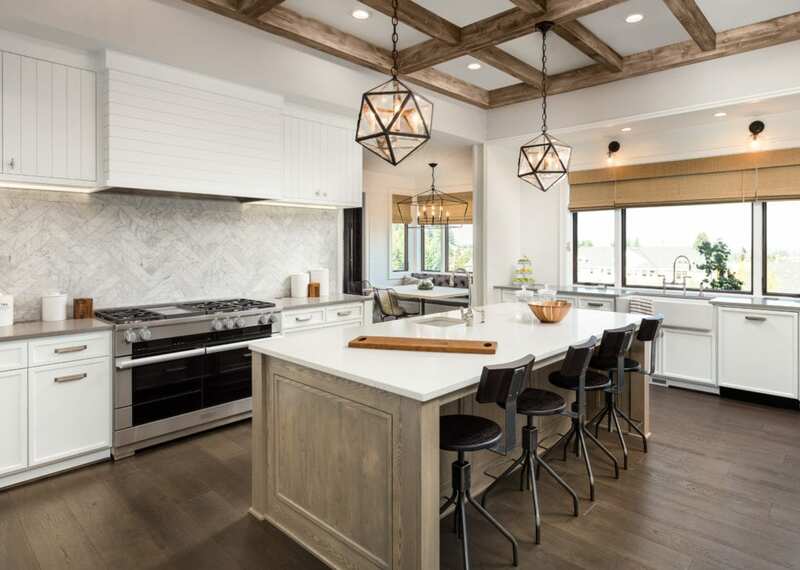 From small accents and upgraded lighting to new paint colors and handcrafted cabinetry, there are a ton of options to turn your boring kitchen into a treasure you’ll enjoy for years to come.